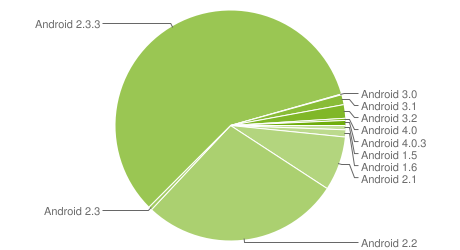 Ice Cream Sandwich is up to a whopping 1 percent of all devices. That's the Galaxy Nexus, of course. Honeycomb (Android 3.0) is still around, hitting 3.4 percent of devices in the past two weeks, up a percentage point from a month ago. Gingerbread (Android 2.3) is at 58.6 percent, up from 55.5 percent last month. Froyo (Android 2.2) fell three percentage points to 27.8 percent. Eclair is hanging on at 7.6 percent, down from 8.5 percent last month. Google is currently activating more than 700,000 Android devices a day.